Social media ads help you reach people in new ways you would never have thought possible. Social media ads are advertisements targeting people who are active on social media platforms. Utilising Facebook, Instagram, Twitter, or LinkedIn’s powerful tools is a powerful and cost effective way to reach your audience, engage, and drive sales. Given that billions of people spend more time on social media than watching TV, it makes sense to go where your audience is. On top of that, since around 2014, the platform’s algorithms have dictated it as necessary to spend in order to be seen. Social media ads are both a necessity and a prize! Global social ad spending doubled from $16 billion in 2014 to $31 billion in 2016 and is projected to continue to rise in 2018.Brightspark Consulting has been running Facebook ad campaigns since 2013. The results that we have achieved from running ads on Facebook, Instagram, Twitter or LinkedIn for clients have been mind blowing! 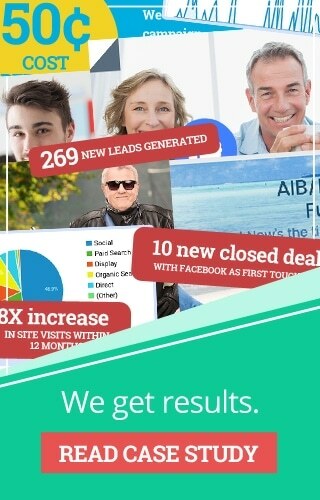 We have grown businesses from zero to €380,000 in leads in less than 6 months. The platforms change all of the time – both in terms of the advertising options available, and how the algorithms display. It takes a lot of time, and education to learn how to do it well. If you don’t want to be wondering just how long it’s going to take your Marketing Manager to work out Ads Manager, or how to get Instagram Stories ads right, hire us to run your social media ads for you. Outsource the techy hard bit to us and be confident that you’re getting the biggest bang for your advertising buck. Save yourself money and save time. Contact us today and let’s talk about your goals, your budget and we can wow you with targeting options.